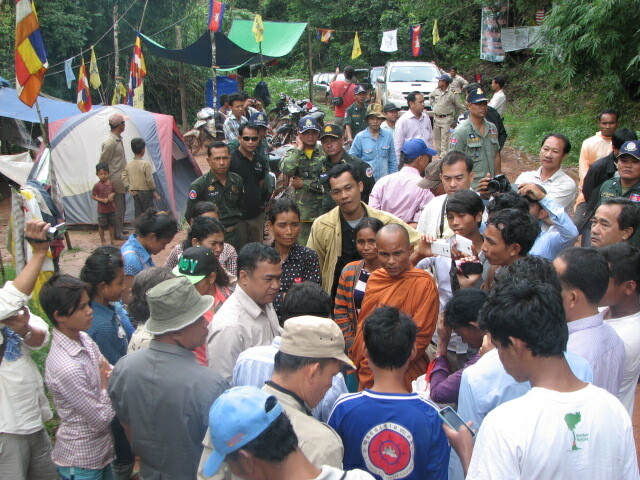 Staff of Mother Nature and protesters on the access road to the Chhay Areng Dam on 15 September 2014. Photo courtesy of Mother Nature. This past February, we released a Briefing Note which addressed the dangerous increasing practice of the government of forcing HRDs, protesters and everyday citizens to sign written statements agreeing to not partake in future demonstrations or illegal activities, as a condition of their release or to avoid charges. The Briefing Note highlighted 6 cases between April 2011 and February 2014 in which protesters had to sign a “contract” to secure their release from detention. While it remains uncertain how these contracts will be further used by the government, this practice represents an unlawful restriction on HRDs’ and individuals’ rights to freedom of expression and assembly and dangerously restricts the environment in which HRDs operate. These tactics used by the government to silence its critics are little more than tactics of intimidation. All of the letters previously signed should be immediately cancelled and considered null, and the government must immediately put an end to this practice of forcing HRDs and citizens to sign statements that restrict their rights to freedom of expression, assembly and association. This entry was posted in Fundamental Freedoms, Human Rights Defenders and tagged Cambodia, Equitable Cambodia, HRDs, Human Rights Defenders, Mother Nature by Cambodian Center for Human Rights. Bookmark the permalink.